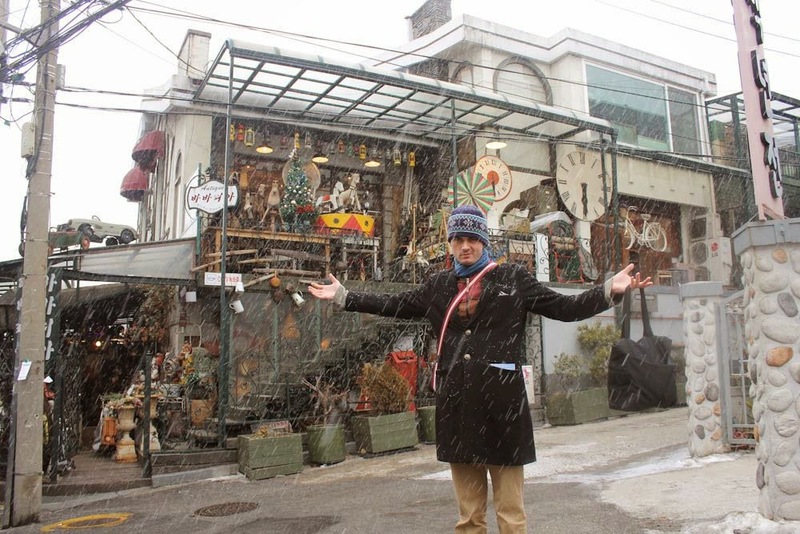 In Seoul you can find just about anything that Korea has to offer within a limited radius. The good stuff can only be found in the rural areas. The exception, of course, is tea. You can find the highest quality teas from Korea and all around Asia on one little street called Insadong. Insadong is a tourist-friendly shopping street in Seoul close to Korea’s premiere historical palace, Gyeong-buk Gung. There you can eat traditional Korean food such as hae-mool pah-john seafood pancake with makgeoli rice wine, samgyeopsal grilled pork with soju alcohol shots, grilled eel with bokbunja black raspberry wine, bulgogi fried meat or bibimbop, bokeumbop and booribop- all different rice dishes served with kimchi and kongnamul beansprouts. The food, however, isn’t the main attraction. You can experience these delights and more outside of Seoul, in the country regions, where traditional food is more conservatively- and cheaply- offered. Also you can see the masks of Ha-wae Talchum here, from the traditional mask-dance of Korea, in particular the maks of Yang-ban, the aristocrat. You can visit Korean calligraphy shops, or find trinkets from Korean religious influences ranging from Taoism and Shamanism to Buddhism and Christianity. Korean musical instruments can be found here too, and there are several chances to view past, modern and innovative art and design. But the real reason to go to Insadong is the tea. The most prominent tea house is the O’Sulloc Tea Shop where demonstrations of their light roasting methods are held daily, and visitors are warmly welcomed to come in and sample their blends and infusions, or just catch a whiff of the aromatic tins stacked neatly in every corner of the room. Sure, when I take someone else there, I take them to O’Sulloc. They love the fragrant fruit teas and exotic blends. There isn’t much, after all, you can do with green tea, except sell the costly ujeong jaksul, “sparrow’s tongue,” a tea picked as soon as it’s ready in the spring, by far the subtlest and finest flavour of nok-cha (from hangul: nok: “green” and cha: “tea”). No, my discovery in Insadong was the Chinese “pu-erh” tea, the first tea that opened my tastebuds to a nice, small cup of tea with no sugar or cream. I had previously preferred flavoured teas. I liked Seattle’s Market Spice, and bought big bags of it whenever I had the chance. I enjoyed the bergamot-flavoured Earl Grey, but shied away from Orange Pekoe and English Breakfast blends. To me those were too ordinary, too Tetley, too English. I could never get into green tea. It’s the diva of teas: if your water is too hot, your steeping period too long or your ratio too heavy, you end up with a bitter cup. But pu-erh tea is a gem. Its long steeping period and 5-6 re-uses makes it a good tea to brew strongly without inviting much bitterness. Let me tell you about my first experience with this precious cup. Like a tourist, I was bumbling around the street, looking for nothing in particular. I plunged my face into a dusty window to check out some old tea-pots I’d seen inside. Tea-ambivalent as I was, I traipsed into the dusty old shop only to see a gaunt man with dark chin-whiskers pouring himself a cup of tea from the world’s smallest teapot. He had a bright look in his eyes, as though he were either very enthusiastic about life, or he’d had too much tea. He was hunched over a small rectangular block of deep, dark tea that looked like black plastic. It had been moulded tightly and imprinted with a scene of a man with an oxcart atop an agrarian pastoral scene. “Okay,” he gave, “you’ll try this, and I’ll have some too in the special small pot.” He unearthed a tiny pot and crumbled a bit of the black block into it. After pouring the brew, he divided the tea three times, a little into each cup, when a gentleman dressed in traditional garb calmly strode into the room and sat across from me at the table. Formalities were exchanged, and this new guest was invited to try the pu-erh, which I learned was a hundred years old. The tea changed the consistency of the water. That was strange. The water became lighter. And somehow… wetter. Yes, this tea was wetter than water. The whole experience confused me. I bought a round of the first pu-erh he gave me. It was a generous amount, probably good for a hundred pots, and it only ran me 50,000 won. I inquired about the century-old brew. “Well, maybe, I can give it to you for 200,000 won.” A small black tablet for two hundred bucks? Yes, it was a great experience, but two hundred? This required some humming and hawing. The notion was ridiculous. I didn’t have the special pot. I could not have replicated the experience. But I’d become so used to bargaining for things in Korean street markets that I felt compelled to make an offer. I returned to the mad hatter’s shop a few times, but it was never the same as the first time. I began trading tea with other teachers. I found out that there was a Tea Underground in Korean schools. There were Korean teachers who used their summers, or knew others who did, to travel and pick up tea from all parts of the world. This led to many sittings for tea, and I began to get a taste for what “tea” actually is. Tea is an event loosely based on the “tah-do” tea ceremony, but incorporating a certain frame of mind, a style of conversation, and a manner of etiquette. Topics discussed during tea include travel, art, philosophy, current events and things of interest to the thought-stimulated, caffeinated mind. Just like people talk about sports over beer, or discuss their personal problems over hard alcohol, tea is a beverage that pairs well with quick minds and lofty topics. I wanted very badly to bring this ritual to my foreign friends. But first, I had to see what a real tea ceremony was like.